Smile Dental started working with jscTEK to enhance their web presence, fully redesign their branding and update various aspects of their website. The creative direction of the new site aimed to compliment Smile Dental's market position as dental experts with innovative technology to care for patient's dental needs. We designed a new site that is powerful and professional, serving as a solid foundation on which we enhance Smile Dental's online presence. Smile Dental's team of doctors care about their client's dental health. Their clean and family-friendly environment offers the latest technology for dental exams, cleanings, fillings, crowns, bridges, and other services for the whole family. Proudly service the Northern Virginia market, they offer convenient appointment times to fit their client's schedule. Smile Dental started working with jscTEK to enhance their web presence, fully redesign their branding and update various aspects of their website. The previous website required a complete overhaul: messaging lacked clarity, site didn’t convey their use of the latest technology, design was outdated, lacked intuitive experience for users to find services and not optimized for multi-platform accessibility. Our objectives were clear from the start. 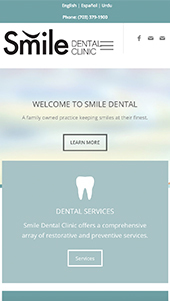 Smile Dental needed an informative new site to appeal to user of all platforms from desktops to mobile. From a user experience standpoint, we restructured the site architecture to plot clear paths for users. Users can quickly and easily find information, resources and contact information. We leveraged messaging from the brand platform to change the conversation from “What We Do” to “How We Help” to resonate with visitors. The creative direction of the new site aimed to compliment Smile Dental's market position as dental experts with innovative technology to care for patient's dental needs. 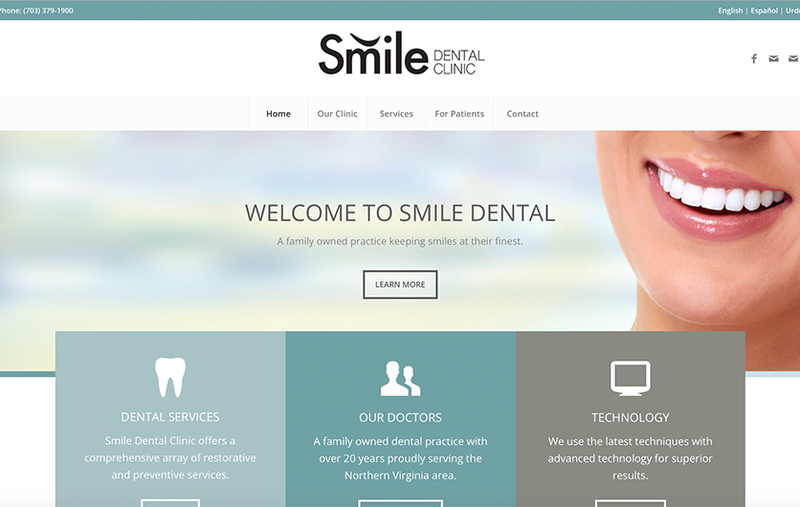 We designed a new site that is powerful and professional, serving as a solid foundation on which we enhance Smile Dental's online presence. Imagery throughout is dynamic and conveys the friendly environment and expert solutions that Smile Dental provides.